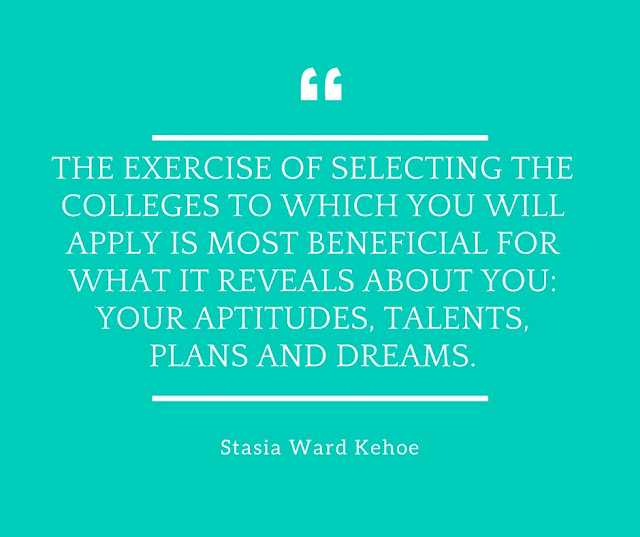 Stasia Ward Kehoe: It's College Application Time: Why did you choose your reach, match and safety schools? 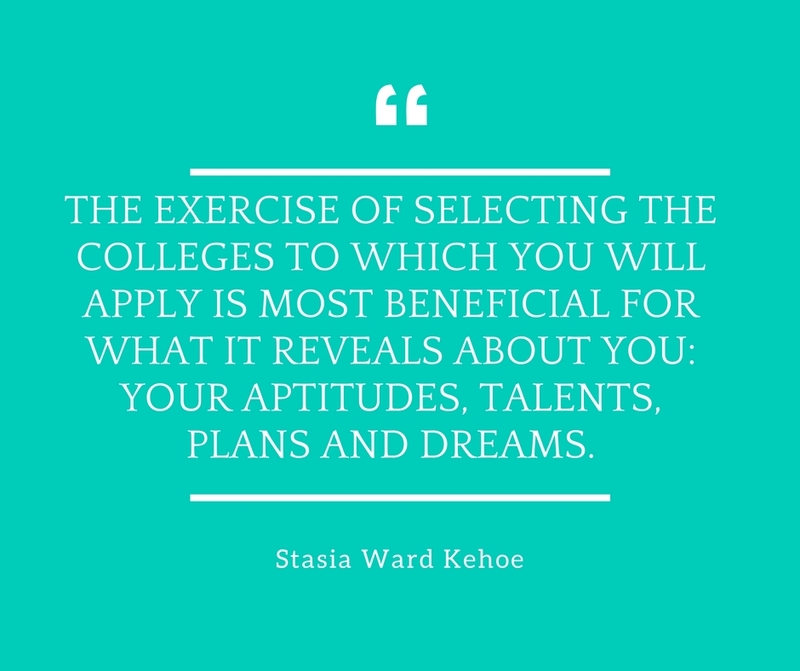 It's College Application Time: Why did you choose your reach, match and safety schools? BAD ANSWERS: It is a cool or famous university. My best friend/girlfriend is applying/attending. I have seen it. It is near my house. While not necessarily untrue, are these answers getting you or the desired institution any closer together? No. Are they good reasons to apply to a university? Probably not. Consider these GOOD ANSWERS: It has a great undergraduate writing/biology/business program. Professor X teaches there and I’ve read all her books. I attended a summer program there AND enjoyed Y about it. It offers both X program and Y activity. As you continue completing the worksheet, avoid citing your GPA or test scores, commute times, or the fact that you googled “business schools in Alabama" and got this one. Try instead for specific answers related to how a school can support your planned course of study, extracurricular/community objectives, and long-term career plans. Find an honest reason you would “enjoy attending” even your safety schools. Otherwise, this process can kind of like walking a plank. Are there any similarities between the schools I am choosing (e.g., strong Spanish departments, BS/MS Engineering options, fantastic school newspapers, ten a capella groups)? Am I using the same type of language across many of the explanations about why I would be a good fit or enjoy attending (e.g., I have student leadership experience or I would like to continue tutoring kids through your college’s terrific outreach program)? 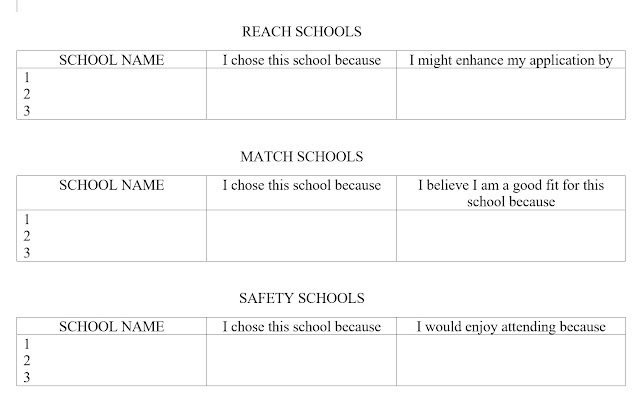 For the reach schools, would you like to follow through on the steps that might enhance your application? 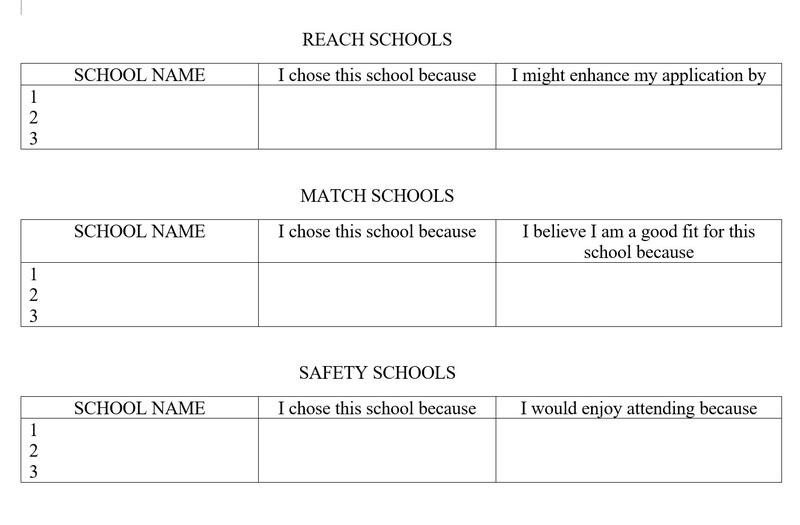 Why did you list this as a reach school in the first place? Do I honestly believe I would be a good fit for every college on this list? Does each of these schools truly belong on my application list? Now, circle the name of the college that you feel is the most natural fit for you (it may be a reach, a match or even a safety school). Write a one paragraph letter to someone important in your life (a parent, friend, girlfriend, mentor) explaining why you want to attend this school. Somewhere in that paragraph, there is likely the germ of an idea for your Common App essay. And you haven't even looked at the prompt options yet! DON'T, by the way. I'll tell you why in a coming post.